A dad of two Berkhamsted secondary school students is running the Paris Marathon next month in a bid to raise sponsorship funds to equip the new sports hall currently under construction at Ashlyns School. Russell Green, who has a son and daughter at the school, is aiming to beat the total of £2,000 he raised for a local charity when he ran the Virgin London Marathon in 2014 – and is also hoping the training he’s put in will bring him a new PB in the 26.2 mile challenge. Green, director of corporate sales at the InterContinental Hotels Group in Bucks, said that he couldn’t think of a better cause to run for at this year’s Paris Marathon. “I think we can all agree that we can be a healthier society, and that starts with easily accessible sports facilities,” he said. At present, the school of 1,200 students has a 1930s gym facility with room for just one badminton court, and changing rooms are housed in a series of portables outside the main building. I can honestly say that regular running has given me a new lease of life. The new state-of-the-art building will boast a sports hall large enough for four courts and more, as well as a dance studio, a gym with 60 stations and four changing rooms. He began running less than three years ago, after realising that his high cholesterol, sedentary lifestyle and lack of exercise were a ‘perfect storm’ in the making. 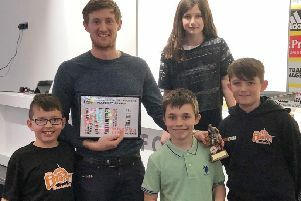 Within the year, he’d won a place in the 2013 London Marathon, running the event for Urban Access – a Hemel Hempstead-based charity which helps children with social issues. He’d hoped to run in London this year, but was unsuccessful in securing a place through the ballot so turned to Paris. With the goal of raising £2,500, Green says he’s already raised more than £300 – a month before the gun goes off. Green’s campaign is part of a wider initiative led by the parent-led Ashlyns School Association to raise a total of £60,000 for new kit. This includes fitness equipment, nets, balls, mats and other items for the new £2 million sports hall, which is scheduled for completion in July. The hall will provide top-notch indoor sports facilities for the school and the wider community, with access to the public in the evenings and on weekends. The ASA ran a successful sponsorship drive earlier this month when it encouraged Ashlyns families to run in the Berkhamsted Five Mile Fun Run, raising more than £3,000 from the dozens of students, parents and staff who took part. To donate to Green’s Ashlyns Sports Hall campaign, please visit https://mydonate.bt.com/fundraisers/russellrunsparis.